MAIN Prjkt - series || 11 weeks || Eisenman, 1986. 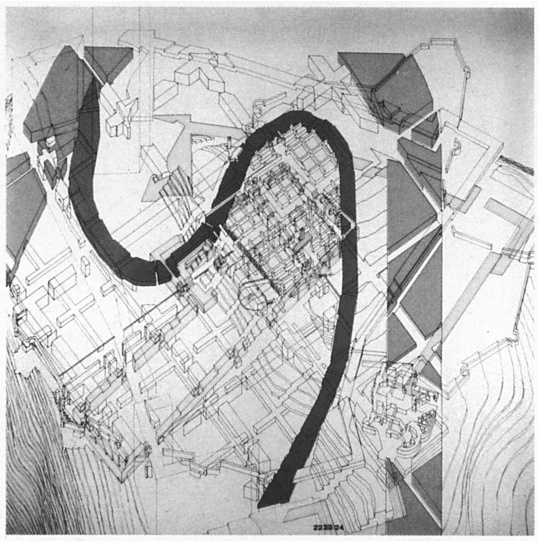 Peter Eisenman, “Moving Arrows, Eros, and Other Errors: An Architecture of Abstinence,” 1986. This entry in the Hays anthology presents us with another series of images accompanied by a blurb from some essay or exhibit. In this case it is Eisenman’s Romeo and Juliet project. The blurb, however, is selectively edited to focus on the specific operations described for this particular project and excludes sections more applicable to Architecture in general. As a result, I’ve ditched the practice of reproducing the blurb below in favor of a normal review, but with Eisenman’s images—which are the real meat of the project. The Romeo and Juliet project is a series of drawings that investigate the architectural and literary context of the story in order to reveal hidden relationships and manifest them architecturally. There is quite a lot to say about the status of the drawings and the architecture they “re-present,” but for now it suffices to say that the various operations and processes that produced them are described at length in the essay—only briefly accompanied by information we can understand as being directed at architecture in general. I have also engaged John Whiteman’s 1986 article, “Site unscene—Notes on architecture and the concept of fiction,” (written with the input of Eisenman himself) to help illuminate Eisenman’s position, as Hays offers no introduction to these blurb-based entries. 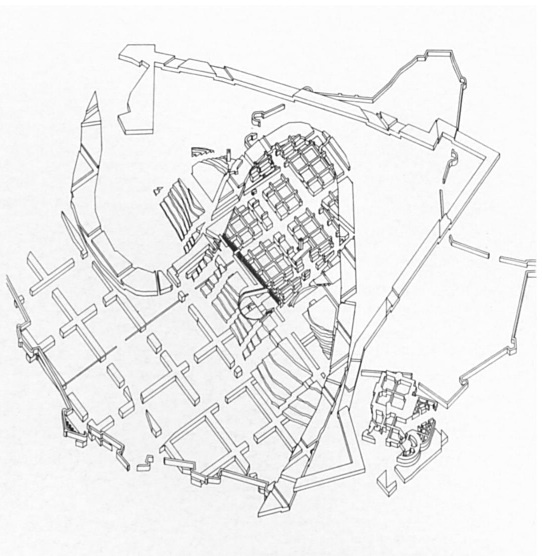 In the 1980s, Eisenman was locked in a thread of intellectual, artistic, and architectural discourse that sought to replace classical anthropocentrism at the root of aristic and architectural production. The history of this discourse may be broken down thusly: there was a belief that the material products of a culture (particularly architecture) might overdetermine the “modes of being of its individuals”; this idea was already outdated in the mid 80s (referred to as “spatial determinism” or “determinate materialism”), and Eisenman took up opposition to this kind of determinism. Nevertheless, the search for non-anthropocentric means of production was a way to produce an alternative material world, a way to both reject determinate materialism and the pervasiveness of the classical structure. Presence, simply put, “is a physically real form, whether a solid, such as a building, or a void, such as a space between two buildings.” That is, presence is the manifest materiality of architecture, its physical presence and the spatial realities generated around it. The eventual destabilization of these two things at the hands of “scaling” also calls destabilizes the aesthetic object, the material object of a piece of architecture composed of origin and presence. Scaling has three functions, or three different “agents” that destabilize the pillars of anthropocentrism: “discontinuity, which confronts the metaphysics of presence; recursivity, which confronts origins; and self-similarity, which confronts representation and the aesthetic object.” These three “agents” work in tandem, building off of each other, and make their confrontations at specific intersections. Discontinuity disrupts and criticizes presence at the point of the site. Traditionally, sites are understood as the sole (and whole) context of a project, and therefore fully understanding a site is a possible, complete body of knowledge. Discontinuity, however, welcomes a variety of contexts well beyond the physical reality of presence, and engages them at the will of the architect or per the item of investigation. It sees a site as a palimpsest and quarry, a layered sample of texts, of past and future. In the case of Verona, the item of investigation is the relationship between urban and object architecture and the story of Romeo and Juliet. The various contexts include urban, literary, and scales of relationships. These non-static levels are part of the arrow of time that simultaneously represents a past (memory) and a near future (immanence). These operations being more or less explained, Eisenman goes on to describe the specific themes explored in the Romeo and Juliet story, and how these three operations are deployed in thematic pursuit. This is the specific function or program of the project, and is absolutely crucial. The architecture that is produced at the end of the series of drawings is fictitious, is an architecture of (literary) fiction, manifesting various themes of Romeo and Juliet. The status of these themes is contentious: on one hand they are kind of pre-existing realities and relationships that Eisenman has excavated out of the city and literature; on the other hand Eisenman’s operations produced them, picks them as separate strands and then creates something out of their collage. This is textual architecture, where origin and creation are blurred, where physical man is utterly dislocated, and consequently an architecture that must be read in order to be understood. The actual status of the architecture is also something to comment on. 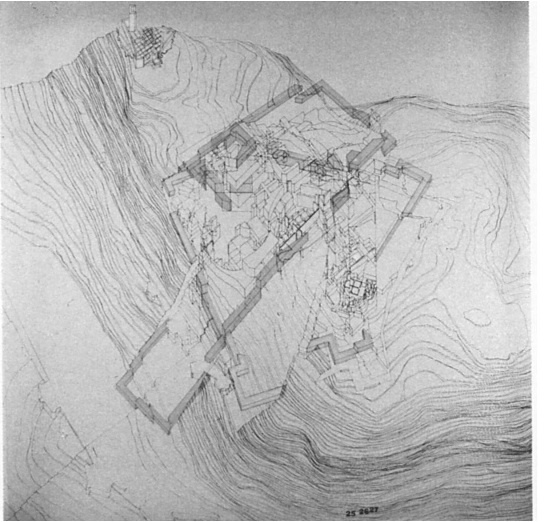 Whiteman insists that Eisenman is prepared to build this architecture, that it is realizable in the sense of physical materiality. However it appears that, above all, this is an architecture that exists like a text: it is represented on paper (in the form of drawings) and refers to something spatial (a built architecture) and yet is neither and both. It is an other architecture, but one that, for all intents and purposes, is a series of drawings. For that we may relate it with the body of drawings that represent an architecture of comparable existential status. 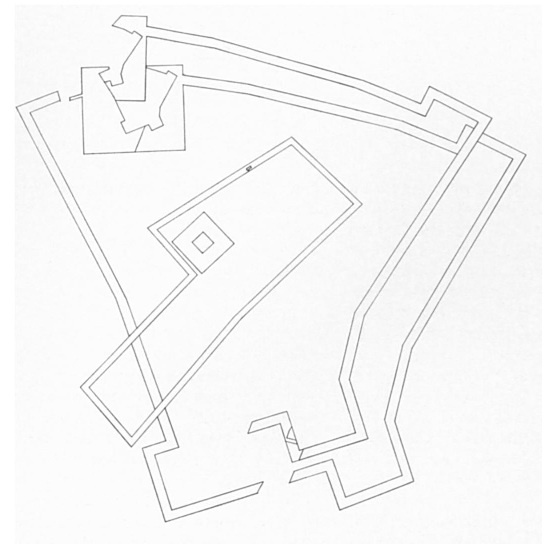 For that I am reminded of Libeskind’s Chamber Works (1, 2), as well as Tschumi’s Manhattan Transcripts and Parc de la Villette—though the latter is more existentially plural: both physical (the built park), represented (the drawings), and textual (described by Derrida). We may then conclude that none of these works is the same as another, but together they inscribe an architecture whose full reality is well beyond the built world, a theoretical investigation very much in vogue in the 1980s, an investigation, it must be said, that was equally invested in disrupting the various metaphysics of architecture.